There are various types of Kaizen. The term “Point Kaizen” or “Kaizen Event” of “Kaizen Training” are well-worn statements. We’re familiar with them, as most companies have tried Kaizen or something Lean related at some point in its existence. But, has anybody actually stopped to ask why we use “Point”? or why we use the term “Event”? Believe it or not, the term “Point” as in “Point Kaizen” has significance. 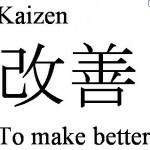 Also, the phrase Before Kaizen and After Kaizen have meaning. Regardless, there are serious feelings involved when facilitating a Kaizen event. 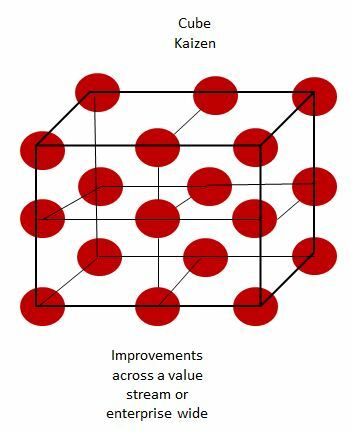 The term “Point” describes the approach to Kaizen, as well as what might be described as a Lean Maturity. I don’t personally like the term “Lean Maturity”, but its descriptive when taken in context. The term “Point Kaizen” is often associated with discrete events in a department or company. 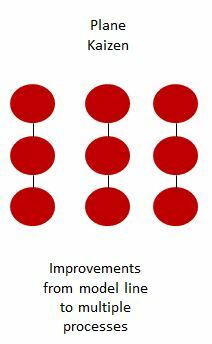 These are continuous improvement activities, where the principles of Lean Manufacturing are applied. “Point” is descriptive because the areas in which Lean is applied are unrelated and discrete. For example, Lean might be applied in the Finance Department as well as in Marketing. But those two Lean Deployments are unrelated with each other. You might visualize Point Kaizen as the following, taken from Hirano 1. 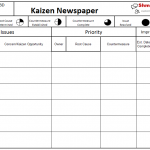 The next step in an organized Lean Deployment is what we know as Line Kaizen. “Line”, within this context, refers to an organized spreading of Lean from Point or Discrete, to the Line. For example, Kaizen might be applied to a process (point), but also to the downstream process. Those two points constitute a Line Kaizen. An example of this might be found in Lean implemented in Procurement, but also implemented in the Planning Department. In this case, Planning is upstream from Procurement and Kaizen is done at those two points; in which case, this would be a Line. The next step in maturity would be connecting several lines together. This we call “Plane Kaizen”. 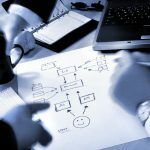 In more modern terms, this might be described as a Value Stream, where instead of traditional departments, the company is organized into product families and value streams. Additionally, we can take this model and plot it against a maturity curve. 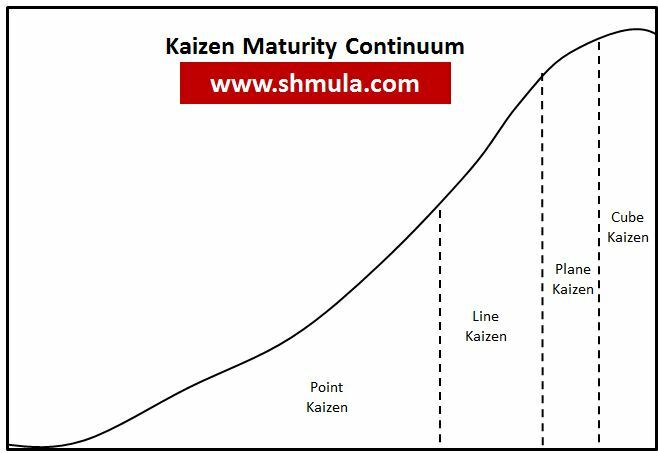 As you can see below, many, many companies dabble in Point Kaizen, but as one goes up the maturity continuum, there are fewer and fewer companies as you go from Point Kaizen to Line Kaizen to Plane Kaizen to Cube Kaizen. What do you think? Does your experience match what Hirano’s Model describes? Interesting concepts. 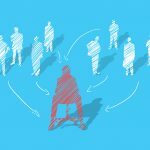 My healthcare organization has been on its lean journey for about 4 years now. 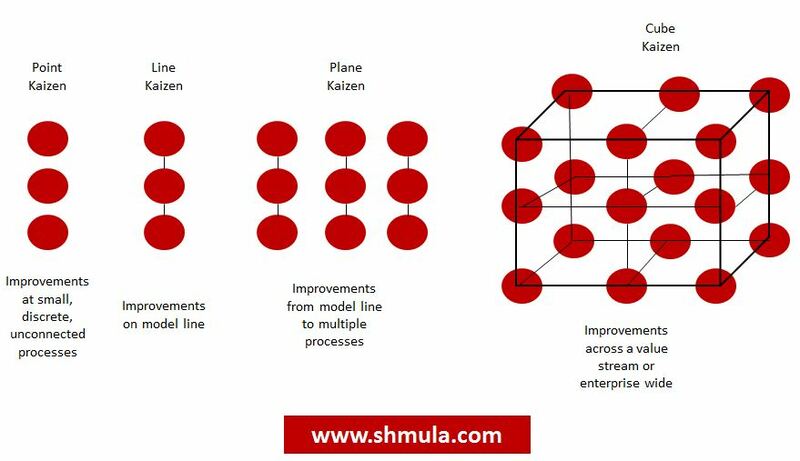 They actually started it with VSM or, based on this model plane kaizen. We have then gone backward and have been working on point kaizens utilizing A3s. As we now progress we have now found that frequently one A3 will spawn another A3 down the stream. And, yes we have actually now encountered A3’s feeding into and from a VSM. My question is now how do we progress from planar kaizens to a cube? We are currently working on utilizing hoshin from the top down and bottom up and, are just now initiating training on lean management systems utilizing huddling on a regular basis around a metrics board.